Titanium has been recognized as an element for more than 200 years. Only in the early 1950’s, however, has the metal gained strategic importance. Titanium and its alloys are first used for aerospace applications due to their high strength-to-density ratios. 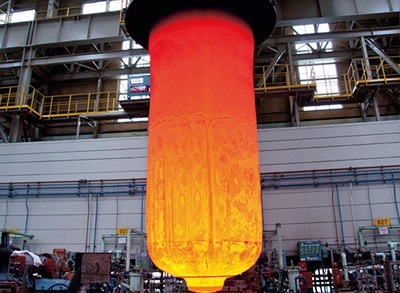 Later, the recognition of the excellent resistant of titanium to many high corrosive environments, particularly oxidizing and chloride-containing process streams, has led to widespread industrial applications. The titanium cylindrical billet produced by Kroll Process. One milestone in the development of titanium is known as “Kroll process”, which is a relatively safe, economical method to produce titanium metal in the late 1930’s. The Kroll process involved reduction of titanium tetrachloride (TiCl4) first with sodium and calcium, and later with magnesium, under an inert gas atmosphere. After WWII and by the late 1940’s, the mechanical properties, physical properties, and alloying characteristics of titanium were defined and the commercial importance of the metal was apparent.